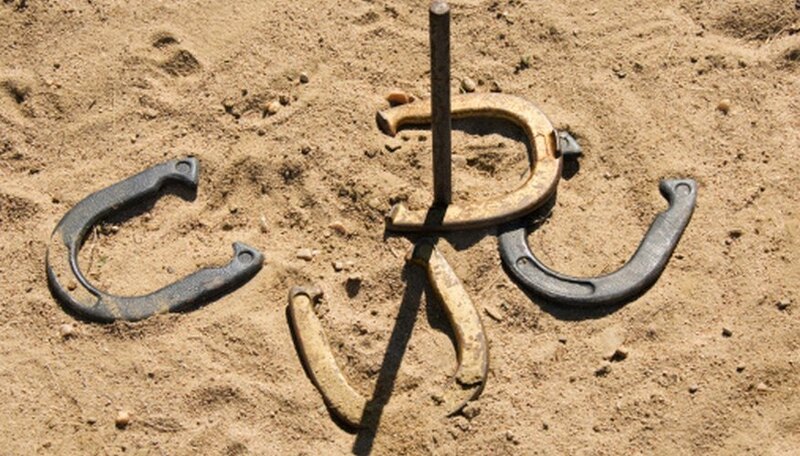 Horseshoes is a traditional backyard party game that challenges players to toss horseshoes at a stake planted in the ground. Typically, players form two teams of two. Two stakes are planted approximately 40 feet apart, and one member from each team stands at each end. In turns, one player from each team tosses two horseshoes at the opposite stake, scoring points for close throws. Horseshoe pits are often constructed with a wooden backdrop to stop throws that are too long. Lay out two 2-by-4 wooden posts vertically on the ground and parallel to each other. Place three 2-by-8 boards horizontally on top of your 2-by-4 posts, creating a backdrop. Adjust the spacing of the 2-by-4s so that each post is halfway between the center of the 2-by-8 and the edge. Screw the 2-by-8 boards to the posts using a power drill and wood screws. Drill two screws into each side of the three boards to ensure stability. Dig two holes in the ground, approximately 18 inches deep, so that you can sink your posts. Lower the backboard into the ground so that the horizontal boards are nearly at ground level. Fill in the holes and pack the dirt so that the posts are sturdy. Use treated wood to make the boards last longer.